Marie Coolidge-Rask. LONDON AFTER MIDNIGHT. Grosset & Dunlap, NY / Reader's Library, London 1928. Photoplay edition issued to coincide with the release of the silent Tod Browning directed film starring Lon Chaney Senior -said to be the first American vampire film. London After Midnight is the most famous of all "lost films" - films of which there is no known surviving print. The book is therefore important as the only tangible record of the work. Chaney stars in a dual role as Scotland Yard Inspector and gives his only movie appearance as a vampire. 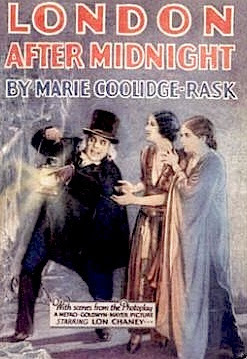 Illustrated with 8 photographs from the movie showing Chaney in his striking makeup and vampire costume. Some say the film was Chaney's masterpiece. One of the good Grossets, normally a reprint house- most G and D books are of low value. The Reader's Library UK ed is rarer and the cover image more striking. Tod(d) Browning also directed the cult fim 'Freaks' using real circus freaks as extras. The book is not especially scarce in either UK or US edition sans d/w although being cheaply made and a little brittle and frail it doesnt usually show up in scintillating condition. Facsimile jackets can be bought for $25 and get placed on the book usually with an unrealistic price hike. VALUE? People ask as much as $1000 for 1928 copies in 2007 facsimile jacket, there is a poorish unjacketed one for $130 , a decent British edition for about $1600 in a genuine but chipped d/w and a decent US ed at $3700, something of a 'dream on' price. A copy in the fake jacket sits unbought on ebay at $1K and 11 ambitiously pricedcopies sit on ABE and have mostly been there a few moons - demonstrating that the right price is probably more sober--copies may well sell against these prices. The chap at Hammer Books who owns both editions (he has been collecting for 40 years) avers that they would probably make $450 to $750 in auction. Rather too modest for sweet copies, but level headed. 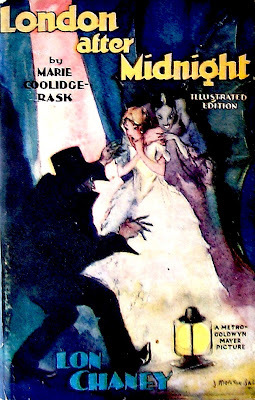 Grosset and Dunlap also did a wonderful photoplay Dracula ($1000) a 'Murders in the Rue Morgue' ($500) and the daddy of them all 'King Kong' (super copies have made $10,000). Came across your blog post. I have a copy of London After Midnight - Readers Library UK ed - copyright edition which I bought at a book fair a few years ago. I was just wondering if you had any pointers for how I check whether this is an original edition and whether the dust jacket is authentic.